I don’t know how to dance. My version of the Cha-Cha is like Optimus Prime of the Transformers moving two steps forward then sliding two steps backward. I’m stiff. My bones act like chopsticks. They’re not flexible like spaghetti.But this I do know: I love watching dancers strut. To be more precise, I love watching our DanceSport Team Cebu City performers dance. Two years ago at the Southeast Asian (SEA) Games held at the Waterfront, I stood on a high chair and gazed at our Cebuano dancers tap, skip, foxtrot and waltz their way to gold medals. Wasn’t that a proud moment? I’ve followed many sports in Cebu and must declare that one of the most successful is Dancesport. Thanks to this couple whose untiring energy pumps like a disco beat: Edward and Eleanor Hayco. With the help of Loi Rendon, the director of Cebu’s dancesport group, Edward and Eleanor Hayco have transformed Cebu into a giant dance floor. In many barangays today, children as young as 8 years old boogie and cha-cha at barangay halls and basketball gyms. Dancesport has also made Cebu more famous. Through dozens of competitions from Las Vegas to Singapore, Cebu is now known as the “Dancesport Capital of the Philippines.” And very soon, the Dancesport capital of Asia. DANCE ON FIRE. Last Thursday night, I watched a show. 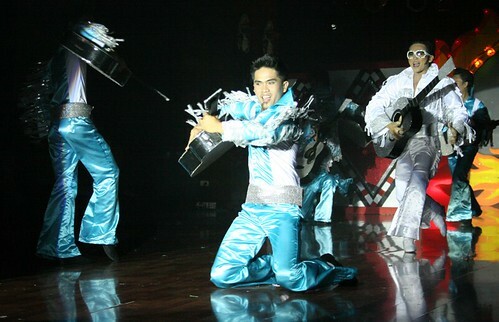 It was held at the Teatro Ballroom of the Casino Filipino at the Waterfront Cebu City Hotel and Casino. What a show! It showcased our Sinulog “Pit Senyor” dances. A documentary of Cebu and our historic dances played on the wide screen. A total of 40 dancers flooded the parquet floor. They boogied, twisted, rocked the Rock ‘n Roll. They impersonated Elvis. They shook to Madonna’s “Material Girl.” They wore black and shuffled to “Beat It” like Michael Jackson. The combined effort from the DanceSport Team Cebu City and the University of Cebu (UC), these performers were not your ordinary dancers. They’re some of the best—in Asia. Right after the show, I approached one couple who performed the night’s most enthralling segment: Israel Rona and Jennifer Amahan. Ordinary names? No. They’ve won dozens of national titles and, last year, got a Bronze in the prestigious Singapore Millennium. Impressive! Costumes? Ahh. Colorful. Intricate. Glittery. You should have seen the glow in the faces of the tourists when the women dancers paraded in a Chorus Line. Or when the men bounced to the Latin beat and replicated Ricky Martin. You see, the entire show was fast-paced, non-stop; mixed with rap, new wave, hip-hop—name it, they danced it. What a show! This is a must-watch for all Cebuanos. It’s a spectacle that will enlarge your eyes. It’s a show that will make you tap your feet and want to shuffle. It’s a Cebuano production performed by Cebuanos for the Cebuanos. “Dance on Fire” is also perfect for tourists. Don’t our guests all want the same two things: Good food and entertainment? Organized by Lyndon Angan (a very good friend and top-notch marketing whiz), “Dance on Fire” combines dinner (a 16- to 20-course buffet by PORT Restaurant) with a 1 ½ hour show. If you choose the dinner-and-show package, it costs P1,200/person. For show only, it’s P900. If there are 10 or more of you, you get a discount. (Tickets are available at the Waterfront lobby or you can call 4124267 or 2319025.) The dinner/show is every Tuesday, Thursday and Sunday night. Dinner starts at 6; the show at 7:30. But back to last Thursday: Would you believe, twice, the lady dancers pulled me from my seat and asked me to shuffle, skip, and twist with them…. right on the dance floor… during the live performance! Ha-ha. It was fun. I looked funny. Imagine chopsticks holding hands with spaghetti? I can just imagine you dancing stiff as a board. hahaha! That must have been a very funny sight. What has Jasmin have to say about that? Yes, dancesport has become very popular in Cebu. I will have to see the show on my next visit in December. Maybe you and Jasmin will accompany me. Maybe if ever you get Dancing with the Stars on TV in the Philippines you will be one of the stars called upon to do the show. The spaghetti shuffle sounds great BUT not with chopsticks. Dancing with the Stars is one of Australias highest rating tv shows. I spoke to Michael Lhuillier about it in 2005 but unfortunately nothing came of it. I think it would be fantastic for Dancesport in the Philippines. HAHAHAHAHAHA! I think good dancing is in-born. My muscles and bones are just too stiff. I’m sure you dance well, right? What’s the secret to good dancing? Graeme: Sorry, that… “What’s the secret to good dancing?” was intended for Bebot… who I know dances well. But mate… I’d never join that Dancing with the Stars. Unless maybe I enroll in a 12-month dancing course first. Bebot: You definitely have to watch the show next time you come! I’m self-conscious so I don’t dance when there are people watching. Some are naturally blessed with a dancing talent but the art can be learned you know. You still have hope. A sense of timing, a good ear for music and a little coordination are all you need to be able to learn how. Yeah, I’ll take you and your girls; Jana might enjoy the show. Wow! A non-dancer dancing on TV? That’s interesting. But you know what, a few years back during the wedding of a relative, a DI (Dance Instructor) coerced me to dance with her and guess what… I felt like a pro! If the instructor is good, she can really just make you sway and swing and look good dancing. But this I’m sure: with his football and foot work skills, I’m sure GRAEME MACKINNON is terrific at dancing! hello can i join as a dance performer? to show my talent…this is the time to show……..